Peter Tarrant was born on a 20 acre smallholding near the village of Morville, Shropshire, where he attended the local school. He went on to the Shrewsbury School of Art in the early 1960’s and after obtaining an NDD (National Diploma in Art & Design); he taught art at Much Wenlock Secondary Modern School for one term in 1965. 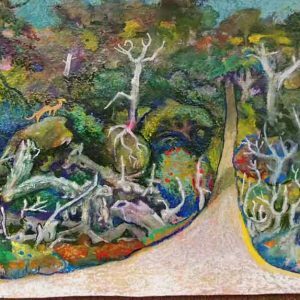 He quickly realised that he wanted to be a full time painter, which he has continued to do for most of his life. Over the years he has had one-man shows in Birmingham, London and throughout Shropshire as well as many group shows. Public Collections include Birmingham City Art Gallery. His background and his love of rural Shropshire heavily influence the subject matter of Peter Tarrant’s work. He is fascinated by folklore, rural life, natural history, geology and farming and his highly detailed pictures are woven with a mixture of fantasy and realism. 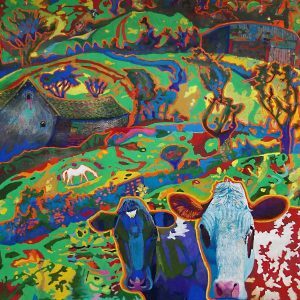 Working mainly on paper with mixed media he interweaves rich colours and textures that form: a canopy of trees, a carpet of leaves, whilst lines of vivid colour outline cows and sheep that appear as if from another world. Like many artists he has many ways of expressing his creative energies. In 1993 he completed an album of alternative music and from 1982 to 1992 he studied paleontology, specialising in fish-like vertebrates resulting in producing two publications. Peter Tarrant’s talent has been recognised by many galleries and although his work is difficult to categorise and is not currently fashionable, he has stayed true to his beliefs and his perceptions. This integrity and sincerity is evident in his work and is made even more powerful in the way he captures a sense of magic in the Shropshire landscape, which he succeeds in sharing with us.